Join Sierra Adventures for scenic and exciting trips that will give you breathtaking views of the Reno/Lake Tahoe area, high above it all. Ballooning is a Nevada classic. Serenely float over Lake Tahoe and the Sierra on this spectacular early-morning adventure. Ballooning on your wedding will truly provide the most unforgettable memory always shared on of this special day. View scenic Lake Tahoe & the High Sierra the way they were meant to be seen... by helicopter. This magnificent tour is as close as you can get to flying like an eagle over the majestic Sierra and Lake Tahoe. Thermals regularly climb to 18,000’. This is our most unique adventure, like flying a magic carpet over Lake Tahoe and the Sierra. Very much like a traditional hang glider, but powered by a reliable aircraft engine. 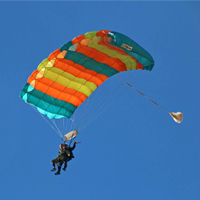 Sky diving is an incredible adrenaline rush that will allow you to break free from 12,000 feet above ground. Stay dry parasailing Lake Tahoe. We use the latest in Parasailing equipment and have flights for all ages and levels of bravery. Get your adrenaline pumping by zip lining 3,000 feet down hill at speeds up to 50 miles per hour in Lake Tahoe. Now available to kids 5+ and including 9 different bridges, 7 short zip lines, 5 vertical climbing events, and a giant swing. Learn to handle and fly hawks. You are invited to try one of the world's oldest sports and enhance your appreciation of these magnificent birds.